A fun action movie with a top rate cast, this one has got it all, from the stunts to the story to the humor. This is the movie that changes the formula up and ends up with incredible results. Die Hard With A Vengeance is so action packed, smart, and intense that it actually rivals the first movie as a contender for the best of the series. New York City is used as a playground for a mad bomber who has a manipulative plan which involves him controlling the police and getting them out of the way. The ideas for this guy, simon’s (Jeremy Irons) challenges are all a lot of fun and so is the explosive madness that results from them. aside from the action and storytelling, there is some strong humor here as well, courtesy of Samuel L. Jackson, coming in and brining a new kind of energy to the series. Every actor delivers here, and the movie finds a way to do it all (even using a bright, sunny setting instead of the dark, gritty one that characterized the two proceeding films.) This movie really delivers. 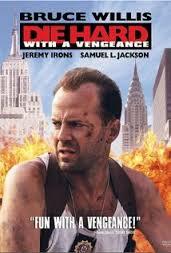 Die Hard: With A Vengeance might very well be the best of the die hard series. It’s either this or the original Die Hard movie from 1989. Sure, that film has all the classic moments, the same way the first Mission Impossible movie does, with Tom Cruise hanging in the air in the white room and all that, but classic moments only mean that it’s the most popular and most well-known of the series. Not necessarily the best. Another great example is the Indiana Jones series. Sure raiders is the movie that kick-started it all, but it’s the third film, Indiana Jones and The Last Crusade, which really gets everything right and is the best of the bunch. Die Hard: With A Vengeance and its relationship to the first Die Hard is probably closest to that Indiana Jones comparison. That’s because like the last crusade, a new character is brought into this third Die Hard movie, as a side-kick, and he makes all the difference in the world. In The Last Crusade, it was Sean Connery. Similarly, die hard with a vengeance brings in a well-known actor to play the side-kick, and here it’s Samuel l. Jackson. Just like Connery did, Jackson provides a certain level of humor that was completely missing from the series before his arrival. 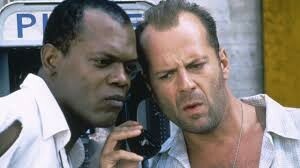 Now, I’m not saying that die hard: with a vengeance is better than the original die hard. Only that it’s a tough call, and that both movies are fantastic. Die hard took place entirely in one building, the nakatomi plaza. Watching Bruce Willis move from floor to floor taking out bad guys was pretty impressive. The sequel, die harder, tried to use the one building idea again, having him spend nearly the entire movie at the airport. It didn’t quite work out the same way. The movie was fine, but a little too dark and serious for it’s own good. Now that sounds like a pretty dopey plot. A Die Hard movie that appears more like a Batman vs. The Riddler episode of campy TV. The fact that this movie takes a storyline about riddles and makes it both scary and intense is a true testament to how great a film this is. The way it accomplishes this is not so easy to understand. For one thing, casting Jeremy Irons as the villain is a move of sheer brilliance. Only Hans’s grubber (Alan Rickman), in the first movie has him beat. The funny thing is that the two characters are supposed to be adopted brothers. Irons are a mad killer who gets bloody and angry at unpredictable moments. It’s not so much that the deaths here, at the hands of Simon (Irons) are extreme, it’s that they are all given the proper amount of time to make us feel for the characters being killed. Whether it’s a cop who has been working with McLane and is now taking Simon’s men down to the sight of a subway car explosion, or an armed guard who sees the bad guys coming in and killing all his buddies on the security screen, knowing there’s nothing he can do but grab a shotgun and just fire away, the action and deaths here are all pretty powerful. Aside from that, the riddles don’t really feel like riddles. They seem more like challenges. Get to the subway platform of Wall Street and answer the payphone there in thirty minutes. Things like that. Sure there are two puzzles to solve thrown into the mix (one an actual riddle about a man and his wives, another a sort of math exercise involving jugs of water), but this is all just a way of getting McLane to spend his day running around the city. Simon wants this guy dead (McLane did drop his brother out of the window of a building in the first film), and he wants him to be tortured before he dies. An example of this torture is the very first situation that Simon sets McLane out on. He needs to go to a certain corner in Harlem and just stand there, wearing a sign that says, “I hate N _____” it’s a sign that all black people who notice him instantly become furious about. Suddenly McLane is being attacked and it’s Sam Jackson’s electrician Zeus who is jumping in to save him. Once we get Jackson, we get humor, and the movie becomes it’s own thing, separate from the other films of the series, which preceded it. One thing cool about this movie, considering how different it is from the others, is that it’s got the same director as the very first film. John McTiernan. The guy was in his prime when he made die hard, and it was right around the same time he turned out both predator and the hunt for red October, his three most well-known films. With Die Hard: With A Vengeance, he brings the same kind of serious and dramatic tone and yet finds a way to lighten the atmosphere and infuse humor through its characters. That’s why this might be the best movie of them all. Because it’s the movie that manages to do everything all at the same time. Die Hard: With A Vengeance is a hell of a lot of fun. Willis and Jackson plow through the streets of New York in ways that show they know the lay of the land. From taking a phone call right outside of Gray’s Papaya (New York’s best hot dogs, short of Nathan’s on Coney island), to racing through Central Park, just to go from north to south and cut out a ton of street lights, the movie really uses new York City to it’s full potential. And the plot involving both the Federal Reserve down in Wall Street and a bomb inside of a school, hits all the right buttons. This movie runs on nervous energy and it does so at a break neck pace. All three lead actors are in top form here, each adding a different dynamic to the tone. It all comes together flawlessly.